MM-3 Kit - Free Shipping! MM-2 Kit - Free Shipping! MM-2Pro SL - Save $50! MM-3 Kit - includes MM-3 Mill with standard 3/8" Drive Shaft, Base, Hopper, Feeler Gauge, and Oil. 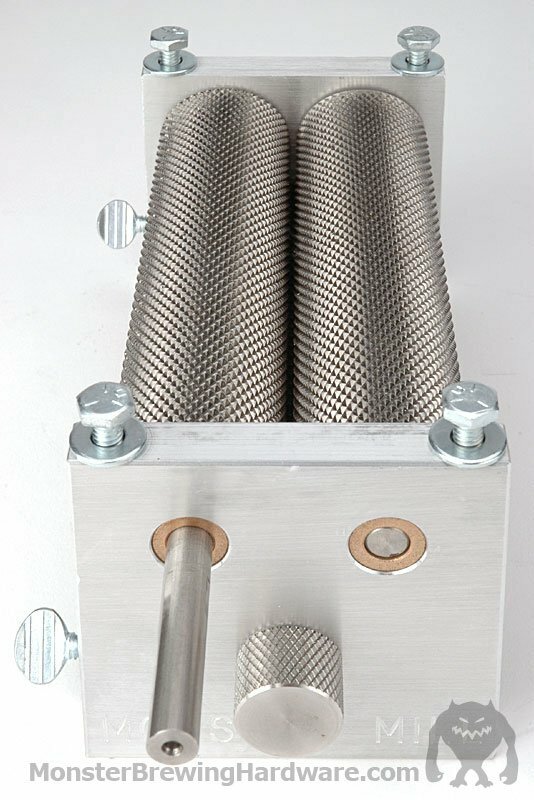 Optional 1/2" Drive Shaft, Steel or 303 SS Rollers, Galvanized or 304 SS Hopper. The MM-3 Kit Consists of the MM-3 mill described below with the base, hopper, feeler gauge, and oil. All this under one part number with FREE SHIPPING! We DO NOT recommend this mill with our standard steel OR our 303 stainless steel rollers for ANY commercial application. We recommend our HEAT TREATED steel rollers available on our Pro series mills for all COMMERCIAL applications. Heat treated rollers last 10X as long as stainless, or our regular steel. 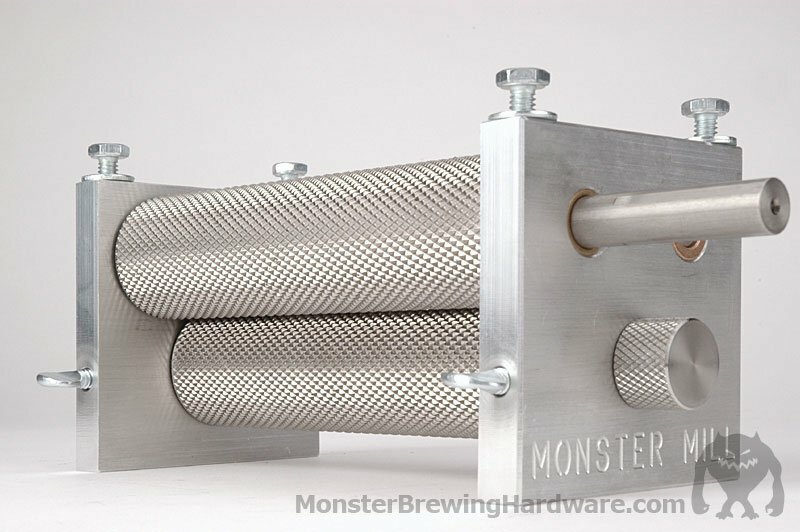 Our 3-Roller Monster is meant to compete and win against the best milling products available. With all the great features of our already popular MM-2, and the addition of a third roller, you'll be able to achieve the best crush around, at a higher throughput speed. The MM-3 crushes all your grain twice, with one pass through the mill. It starts with a preliminary crush through the initial fixed gap between the top two rollers, and then ends with a pass through the second gap between the drive roller, and the bottom third roller. The initial pass slightly flattens the grain, and gets it ready for the next crush, that breaks apart the grains and loosens the starch with minimal husk damage. The MM-3 consists of a 6061 aluminum block frame with three 6" long steel rollers riding on SAE 841 oil impregnated bronze bushings. We use a superior grade of steel that is much harder than what is found on most comparable products and should last almost twice as long. The drive shaft, and all the axles are integral to the roller rather than screwed into the ends. This makes it fine to drive the mill clockwise, or counter-clockwise. All the axles are 3/8", with minimal freeplay in the bushings. With 20% more roller surface area than brand "C", you'll get more throughput with the same drive speed, in either direction! 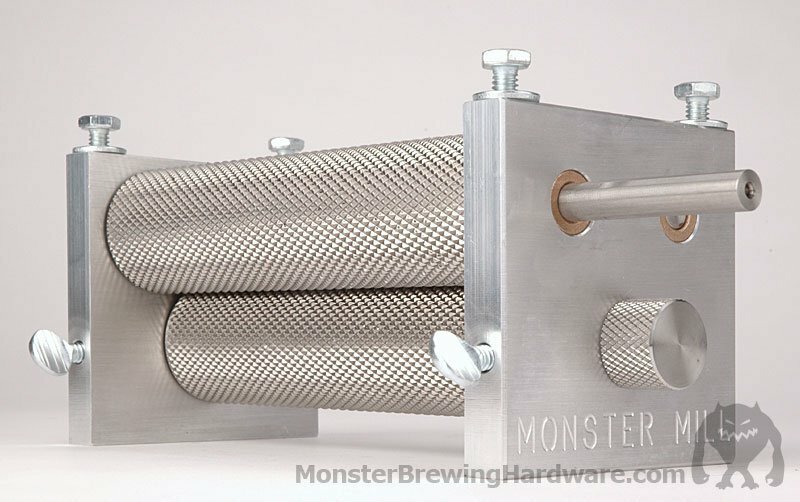 One knurled steel roller is driven by a standard electric drill (not included) to feed the grain through the initial fixed gap of approximately .060", and then through the adjustable secondary gap and crush the grist. Both ends of the non-driven top idler roller ride in bronze bushings that are pressed into the frames, while the second idler roller rides in bushings that are offset mounted in an adjustable knob. 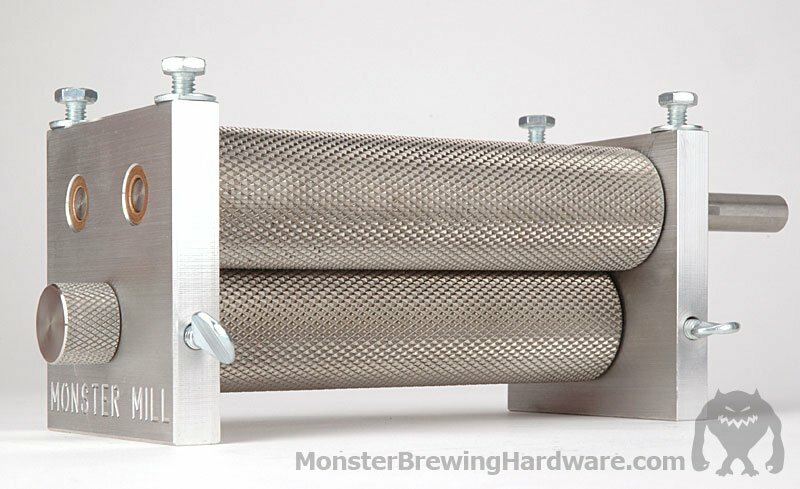 The knob is held in a fixed position by a set-screw that you can loosen to adjust the mill. 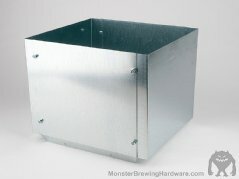 This system provides an adjustment range of .065". Our knobs are made from 303 stainless steel for excellent durability, and are larger in diameter than the competition, as well as knurled for a positive grip. We've also added a groove in our newest design knobs with a matching rounded head on the thumbscrew that allows for a much better grip on the knob to avoid gap changes while milling, and also providing knob retention. If you don't purchase our base and hopper, you will need to fabricate one to feed the grist through the mill. The mill can be mounted above or below the base and attached using the included mounting bolts. You'll also need a high quality corded drill to drive this beast. We recommend a 1/2" drive Dewalt or comparable drill. Please note that the larger shaft option requires the larger 1/2" drive drill, as the more common 3/8" chuck won't accommodate the larger shaft. There are two roller material options available for the standard 1.5" mills. 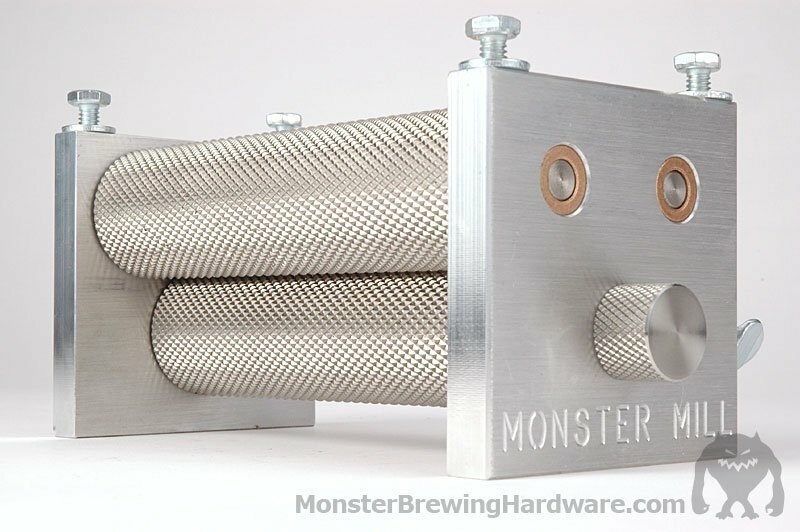 They come standard with 1144 alloy steel, which offers fantastic wear for home brewers. Plain steel mills kept indoors, and used regularly won't have rust issues. Non climate controlled areas, or minimal usage could see some corrosion come up that is easily removed with a wire brush. As an upgrade to 1144 steel we offer 303 Stainless Steel. It will wear just about the same as our 1144 steel, but will not rust. Recommended for those that live in salty or moist environments, and those that want to wet mill. 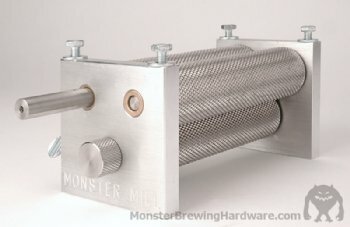 We do NOT recommend this mill for any commercial operation, brew shop, brewery etc. 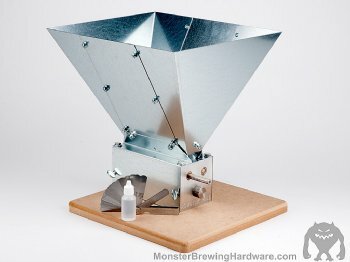 IF you are ordering a single mill, two mills, a mill with a base and hopper or hopper only, a hopper, a base and hopper, or any of the above with a hopper extension, then the shopping cart software should correctly calculate your shipping charges for all destinations via USPS Priority mail.